It is a rechargeable LED lantern that is equipped to provide light for as long as 60 hours on just a single charge. Magneto Lantern is a projected as a sturdy and reliable LED lantern that comes to the rescue not only indoors (in case of an emergency light power failure) but is also perfect for outdoors use. 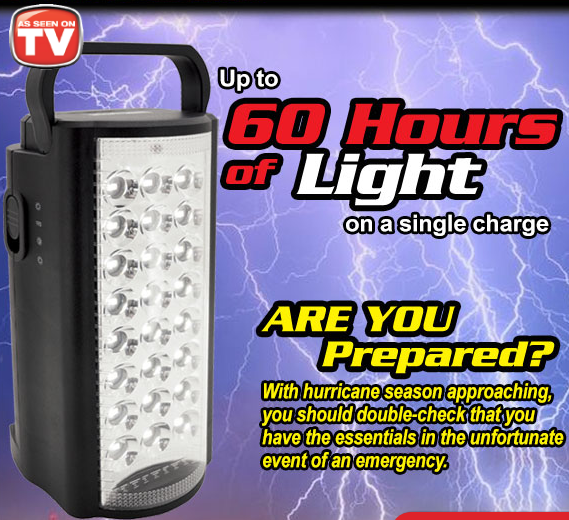 The manufacturers of Magneto Lantern claim that it is equipped to provide bright light for hours consistently in virtually every situation, including in case of a hurricane. As a rechargeable LED lantern, this LED lantern is exceptionally bright and powerful and can even be seen from as far as two miles. It boasts of 1,000 lumens light output, which ensures reliable supply of adequate light anywhere anytime and even turns on naturally in case of power outage and detects power outages promptly. Magneto Lantern is the perfect lantern that assists in sudden night-time situations and can be taken out while mountaineering, camping, picnicking, etc. It works on two modes, viz. Power-Saver and Ultra-Bright, which you can choose as per your requirement. Further, Magneto Lantern comes with a big USB and a huge 6V battery that ensure supply of power for long even though it is compact and therefore easy to use and carry around. According to most customers who have used Magneto Lantern, it is a handy and decent LED Lantern that provides a good amount of light although some scope for improvement is there in it. Quite a few customers have appreciated the dependability and adaptability of Magneto Lantern. They think it is a compact and lightweight device as well as handy and durable. However, some customers who have been using Magneto Lantern have pointed out certain limitations that mar its functionality. According to some of them, Magneto Lantern doesn’t give a full 360 degrees of light like a gas lantern does in every situation. Also, it doesn’t provide lighting from its base due to which there’s no point hanging it from a ceiling if lighting is needed from a height. It also becomes difficult to position the lantern for adequate lighting in some cases, which is contrary to what they expected from it. One of the users has complained that Magneto Lantern its USB charging is not up to the mark. He’s unable to charge his Samsung Galaxy S6 Edge and says that its battery actually drained when it was connected to it. Some other customers have said that their devices only show they are in the charging mode when connected to Magneto Lantern for charging while in fact they charging doesn’t happen. Also, its battery does not last for all 60 hours as its makers proclaim; some say it doesn’t last for even half of it. One of the customers has complained that Magneto Lantern is not sturdy enough for outdoors use. He has to wrap it in layers of cloth to ensure it doesn’t get damaged. He says that the on and off button of his Magneto Lantern also broke within just 6-12 times of use, and he had to get it fixed. 2 Comments on "Magneto Lantern REVIEW"
There is no green light to let you know it’s fully charged. You have to have it on charge for 16 – 20 hours to ensure that it is fully charged.